Eloy "Ocean II - The Answer"
Man is a prisoner of time, yet time lives in Eternity Eloy's classic tale of the mythological Poseidon, the creation of Atlantis and it's eventual destruction in Ocean in 1977 promised a return of Atlantis' secrets as the third millennium approached ... and this latest offering from arguably Germany's most creative and talented "Art Rock" outfit does not disappoint! 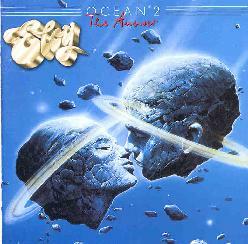 More than twenty years after the release of Ocean, the original album continues to inspire Eloy's many fans, and the announcement that they were to record a 'sequel' ensured that The Answer would be the most anticipated release from the band in it's long and productive history. The use of the incredible artwork of Wojtek Siudmak immediately impresses the intended continuation of the original story, an impression which is only strengthened by the orchestral overtones and mournful siren-like harmonies in the opening instrumental Between Future and Past and it's segue into Ro Sefan which sets the scene for the rest of the album. Musically, the album has all the classic Eloy hallmarks, from the inspiring choir-like backing vocals, wonderful instrumentation and Frank Bornemann's unique vocal style. Eloy's albums from the late 70's (such as Ocean, Dawn, & Colours) have always had what could best bedescribed as a 'full' sound - this release sees a welcome return to this style which seems to havebeen less focused on latter albums. At the same time, the sounds that they have developed overthe last decade have not been forgotten, and listening to the album there is a merging of the oldand the new which results in a feeling of completeness. For Eloy fans, this is a must-have item. For those of you with a few Eloy albums in your collection - it's time to add one more. For those who have never heard Eloy, now is the time to discover what you are missing! Eloy's music has always resided in the continuum between symphonic prog and spacerock, and despite being from Germany, not really part (stylistically-speaking) of the psychedelic movement known as "krautrock." This album is no exception, and actually rights a lot of the wrongs that were present on other recent efforts like Destination and Ra. On those albums, Frank Bornemann had metallized his sound a bit too much (trading poignancy for bravado) and his vocals too often sounded 'pinched.' Since then, the return of Klaus-Peter Matziol on bass (and perhaps changing attitudes towards heavier music) has led Eloy back towards where they were once great, ie., grandiose conceptual works that are both musically compelling and eminently ethereal. To be honest, I can't really tell how Ocean 2 conceptually fits into the original Ocean (1976) story, but then I only 'get' these concepts when presented in a multi-media format anyway. But musically speaking, the link between the two albums is almost seamless, despite the 22-year wait. "Paralysed Civilization" and "Awakening of Consciousness" are instant classics that are a step up from anything on 1994's The Tide Returns Forever. The synth stylings of Michael Gerlach and Bornemann's peculiar fretting style (where each note is kind of 'scooped') still produce that unique brand of spaciness that Eloy has always maintained, and Matziol's chunky bass lines are the best in years. And Frank's voice (still heavily accented) is back to where it should be, stronger and more certain than ever. Ocean 2 is a triumphant return for Eloy, a band that had almost lost its way a decade ago.